The water treatment process truly begins with a very brief turn in a flash mixing chamber. After screening out debris and testing raw water, chemicals that encourage coagulation are added to the water stream. The mixture is agitated quickly and thoroughly in a process called flash mixing. The chemicals introduced into the water stream will attract any very fine particles, such as silt, that will not readily settle or filter out and make them clump together. These larger, heavier formations are called floc, which are much easier to remove from the water. In the case of the flocculation process, the rapid mixer is specifically designed to disperse polymers so they enhance flocculation by optimizing the strength, size and weight of the floc. Rapid mixers are used to violently agitate the water with the chemicals for a short period of time before being released into the flocculation basin. The duration of the flash mix chamber is carefully controlled, and typically lasts from 10-90 seconds. If the duration of the flash mix is not long enough, the chemicals will not be properly distributed throughout the water. Too long, and the newly formed floc will be damaged by impeller shear. When determining the length of time that water needs to spend in the flash mix chamber, duration is calculated using the size of the tank and the volume of flow. 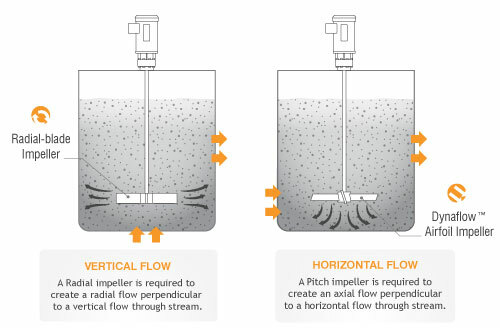 The directional flow of the mixing chamber will determine the appropriate mixing flow to disperse chemicals throughout the water stream quickly. In order to rapidly blend the chemicals uniformly, a mixer needs to create a flow pattern at a right angle to the flow through stream. This will increase distribution and reduce residence time in the flash mix basin. The mixer will commonly be center mounted with a vertical shaft to accomplish this effect. Both approaches require a high speed rapid mixer that produces vigorous or violent mixing. All Dynamix mixers can be configured to meet your application requirements. For more information on all Dynamix mixer lines, visit our Product page. There is more to Rapid Mixing than just the application of a high speed mixer to help disperse chemicals. Torque and impeller selection play a very important role in achieving the desired result. The DynaflowTM axial flow impeller is ideal for creating the vertical, right angle flow required to disperse a horizontal flow in flash mixing.